Imagine a metal tube of human sardines flying through the air. Sixteen people are crammed tightly together inside with their thighs pressed up against their chests and modestly full day packs balanced on top of their knees. Most of them are sucking on boiled sweets that a stooping air stewardess has provided them with as she squeezes her way down the inside of the tube. Despite sucking furiously, their ears keep popping anyway. Up ahead the door to the cockpit is open, so the sardines can clearly see that the pilot is reading a newspaper. Hopefully he puts it down when a large gust of wind buffets the tube and throws everyone sideways. This happens quite regularly. Out of the window the scenery is dramatic. 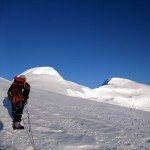 A great many huge white snow mountains hang on the skyline miles above. They’re so high up the sardines can’t even be sure which ones are mountains and which are clouds. Even the green forested lower foothills rise high above them. Come to think of it, the green forested foothills look alarmingly close. Then suddenly the tube starts plummeting towards one of them, and is if by magic what looks to be the shortest runway in the world appears out of nowhere. Luckily the pilot has now put down his newspaper to let the tube fall gently onto the tarmac. Then he rams the brakes on and brings everything to an emergency stop in front of a high wall that lots of sightseers are standing on top of, taking photographs. 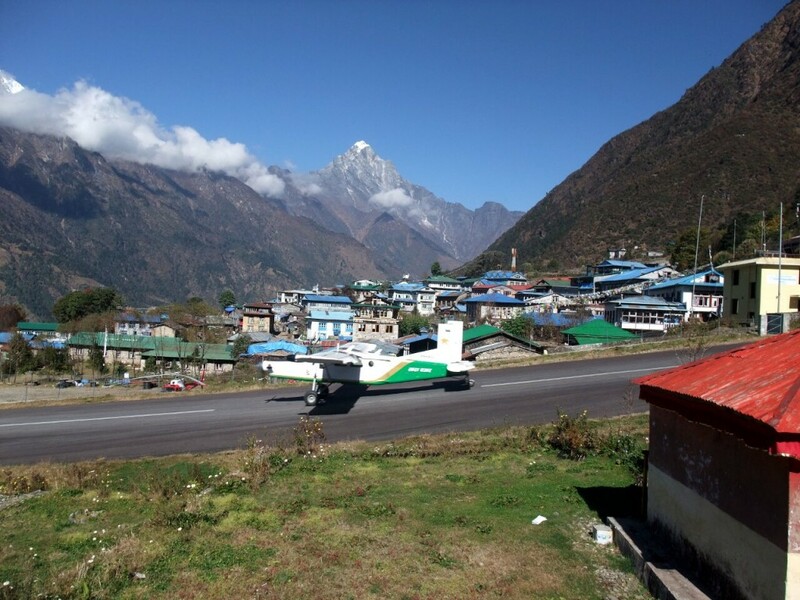 Only it’s not an emergency stop – it’s normal procedure, and a Twin Otter plane has just landed in Tenzing-Hillary Airport, Lukla, Nepal, considered by many to be the world’s scariest. But is this justified? Last week thousands of trekkers were stranded in Lukla, a small community of tea houses perched on a ledge of terraced fields high above the steep-sided Dudh Khosi valley, surrounded by mountains. It’s not an obvious location for an airport, but Sir Edmund Hillary spotted there might just be enough space for one in 1964 when the Himalayan Trust, the charity he founded, was transporting materials for the many schools and hospitals it was building in the region. Because of the airport this once unimportant village has now become the gateway to the Everest region, and has grown into a small town with many tourist lodges, though not enough to cope very easily with the estimated 3500 trekkers who were stuck there last week waiting for flights. 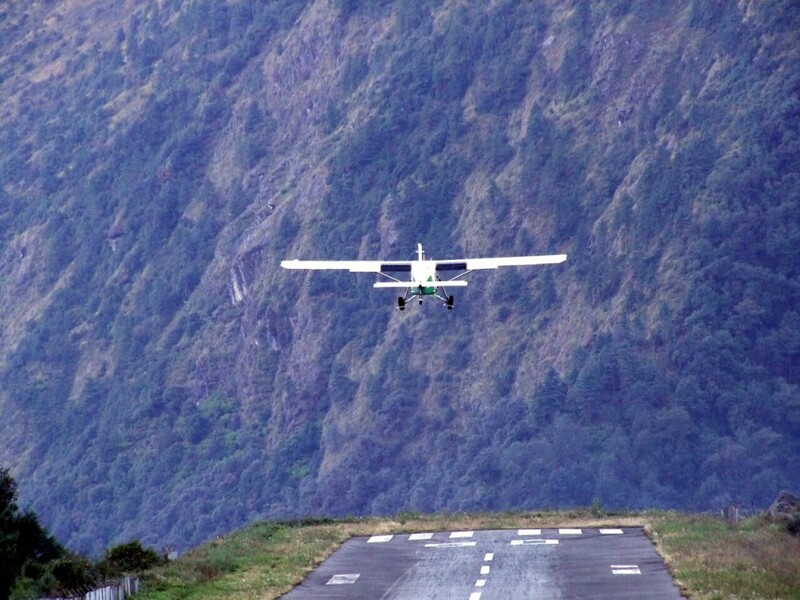 Most people think the scary thing about Lukla is the length of the runway, which slopes steeply upwards to assist planes that have just landed to slow down before they crash into the wall at the far end. And the fact the runway is perched hundreds of metres above the valley floor has given rise to the legend that planes don’t even have to take off properly, because they can simply fall off the end of the runway into the valley and still have plenty of time to rise back up again. Probably more dangerous than the runway is that pilots have to land by line-of-sight only. 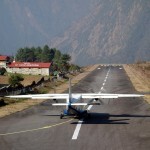 In October 2008 three Twin Otters were landing in quick succession, standard practice at Lukla Airport, where the planes can turn around and be off again very quickly. The first two landed safely, but just as the third was approaching the airstrip a cloud swept in front of the pilot’s vision causing him to misjudge the landing slightly and catch one of the wings of the plane in a wire fence to the side of the runway. The plane burst into flames, killing everyone on board except the pilot, who was the only one able to escape from the fireball. Accidents like this are rare, and there have been no fatalities at Lukla since this one, but it’s because of the risk in bad weather that the airport regularly closes whenever there is fog like there has been this last week. Turning up to board in Lukla or Kathmandu, you become used to keeping your fingers crossed. Often some of the flights take off, but halfway through the morning the weather closes in and the rest get cancelled. I’ve been lucky, really. Only once in the seven occasions I’ve made the journey have I had to come back the following day, and generally I’ve actually quite enjoyed the flights. There was one occasion when our tiny tube of sardines flew straight through a rainstorm and I realised just how flimsy a Twin Otter aircraft is when up against the elements. That was a bit hairy, but luckily that was flying from Lukla to Kathmandu, and by the time we dropped down out of the clouds and approached the airport all was calm, though I did hear later that all subsequent flights had been cancelled. When flights are so unreliable and nail biting you might imagine there’s some alternative that more nervous trekkers would prefer. There is one, but it’s a different kettle of fish entirely, more of a sea horse than a sardine, in fact, for sea horses are known for moving extremely slowly. Instead of a 45 minute flight, you’re looking at a ten hour bus ride from Kathmandu to the trailhead at Jiri, followed by a six to eight day trek to Lukla, depending on how long you want to give yourself to acclimatise. I’ve not done this trek myself, but I’ve heard good things about it, crossing several ridges and valleys as it cuts across the grain of the land with wide views of Everest in the distance. For those with time on their hands it’s definitely the way to approach Everest. Most people don’t have this luxury, though. 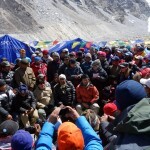 Most of the trekkers who come here have only taken two or three weeks off work and are on set itineraries leaving them just enough time to acclimatise on their way to Everest Base Camp. I definitely hope to give myself enough time to trek in from Jiri some day, but in the meantime I’ll keep using the Twin Otter flight to Lukla. It’s not that bad, really. Look, here’s some video footage I filmed of planes taking off, and contrary to popular belief they do actually take off upwards. The footage of Lukla Airport starts at 3:50 in the video, but do yourself a favour and watch the whole thing, as the first bit will definitely give you a taste for trekking in Nepal, one of life’s great experiences. Hi Mark – I was supposed to be on the flight you reference crashing in 2008. Our group was bumped to a later flight and another (presumably more important) group took our place. I’ve never argued with an airline since then when they bump me! Eek, I think that’s what they call objective danger. It’s not how the World’s Top Motorcycle Dealer would want to go! Nice post, I like mountains and also wants to spend holidays there. I’m trekking there in August and trying to be as prepared as possible. Can you remember if you had to be weighed for weight distribution on the plane for the flight to Lukla on the Twin Otter aircraft? Yes, worth checking with the airline or your trekking agent. If I remember rightly the weight allowance is not very much. 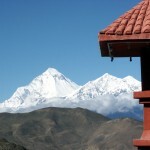 Would you be able to suggest what is the safest airlines from kathmandu to lukla and return? Having said that, I’ve flown the Lukla flight several times with different airlines and I’m still alive. Fingers crossed!